So, remember on Monday when I mentioned that I may or may not have a salad that tastes like SUMMER IN A BOWL? Juicy tomatoes + sweet peaches + crunchy bread + basil + the best dressing ever = SUMMER IN A BOWL. 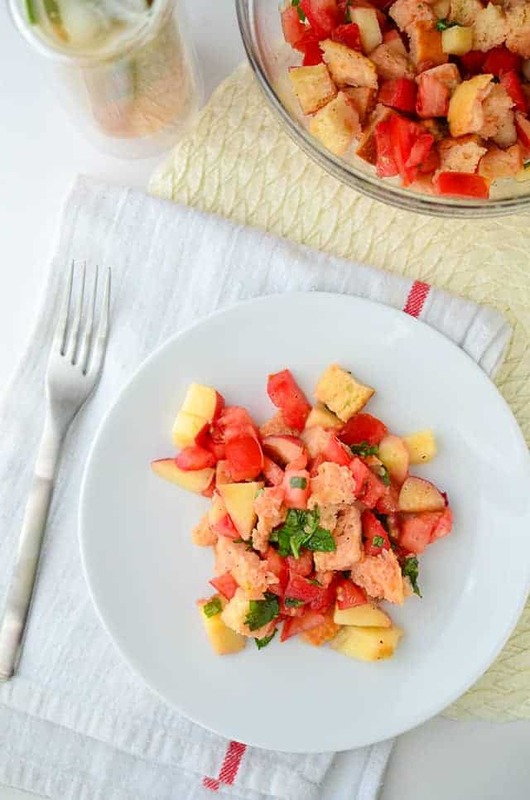 AKA Peach Panzanella Salad. The next recipe in our Basil Week lineup. It’s simple but always impressive. Plus, it’s a salad that contains bread so win-win-win. I eat a lot of salads in the summer, but classic panzanella is my absolute favorite. The beauty of this salad is that there isn’t really any specific recipe. Want a bit more crunch? Add in diced cucumbers or red onions. Craving creamy? Avocado or mozzarella balls each fit the bill. I like to make this salad when I am heading to a potluck or having guests over but don’t really want to cook. A giant bowl of this, maybe some corn on the cob and peach basil iced tea… I dream of this delicious salad all year long. The secret to this particular salad is that I call for uber fancy white balsamic reduction in the dressing. Yes, you could use regular white wine vinegar, champagne vinegar, white balsamic vinegar or no vinegar at all BUT you should try it with white balsamic reduction. I came across a bottle when we were in Paris a few weeks ago and it took all my might not to scoop up 15 bottles, (I guess the three I stuffed in my suitcase will have to do). Just like the original, white balsamic reduction tastes amazing on everything. Like regular balsamic vinegar, only lighter, and fancier. Oh, you fancy? Yeah. Summer in a bowl! Fresh peaches, tomatoes, basil and crusty bread with white balsamic dressing. Place the cubed bread bread on a baking sheet and toast for 3-4 minutes each side until golden and crusty. Place the minced garlic clove in a small bowl with the [url:2]balsamic reduction[/url]. Whisk together and slowly drizzle in the olive oil until an emulsion forms. 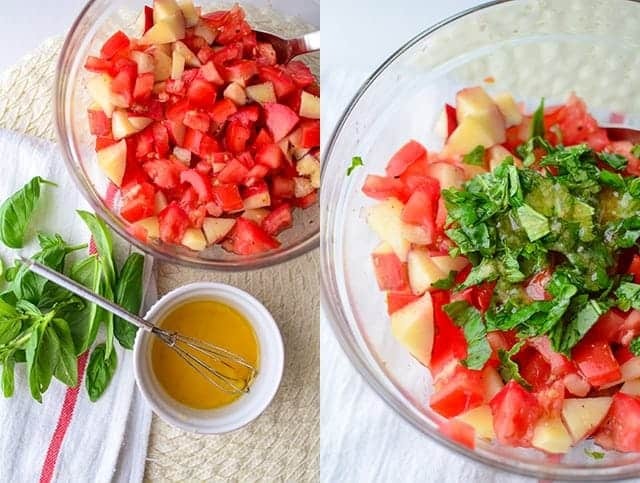 Toss the bread cubes, peaches, tomatoes and basil leaves with the dressing. 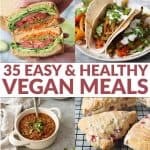 This sounds amazing!! Believe it or not, I’ve never had a panzanella salad. Must put it on my summer to-do list! 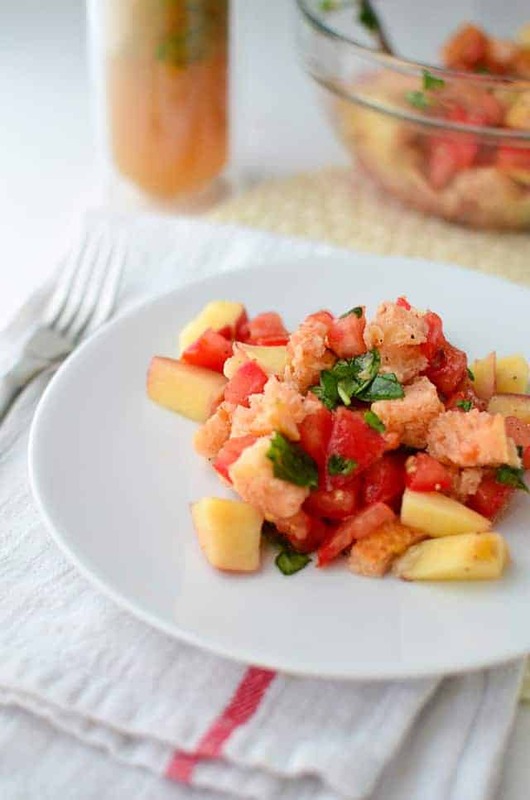 LOVE this take on panzanella. I need this in my life! Peaches are the shining stars of summer for me and mixing them with savoury flavour is just so right on. 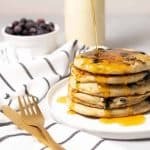 This recipe looks magical and I want it right now! Yum – I have a similar cherry bread salad I’m posting in a few weeks – your version looks delish!